Sattu ka paratha is truly banaras ka khana. Sattu is a flour of roasted gram and it is available in banaras very easily. Litti chokha might have come to Banaras via Bihar, the neighboring state but litti chokha and sattu ka paratha both are considered as their own by all Banaras walas. When I don't get sattu it here in Delhi, I just powder some roasted gram in the spice grinder and use accordingly. Sattu can be used in so many healthy ways you know it already if you are looking for sattu ka paratha. 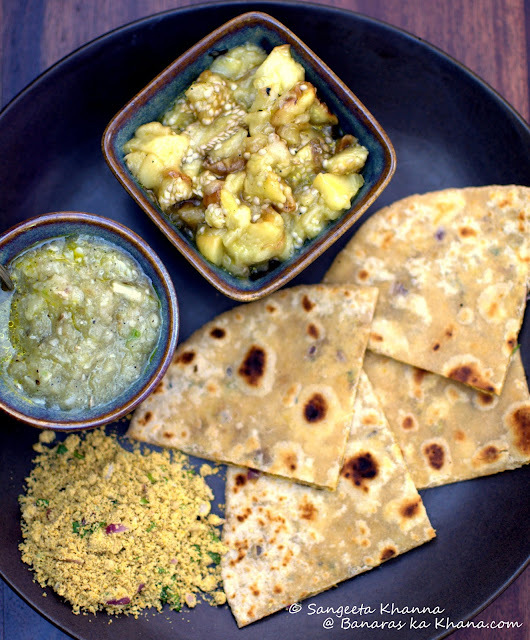 This paratha is a tasty and healthy food when served with tomato salsa or baingan ks bharta , or baingan ka chokha but most of the people like it as it is, may be with a bowl of dahi or some pickle or may be green coriander mint chutney too. 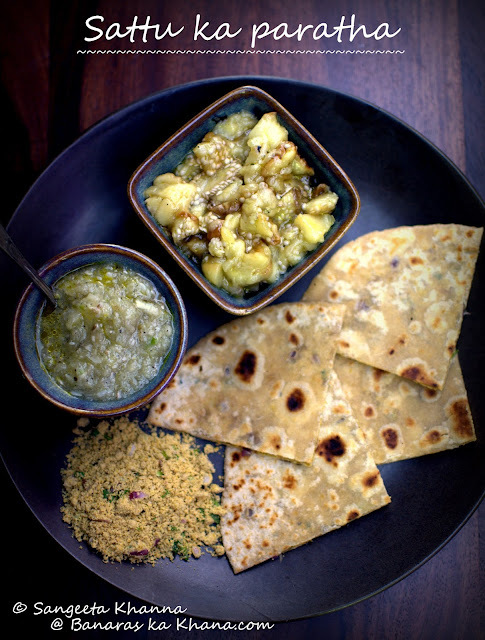 Sattu ka paratha is a mundane breakfast for many so they don;t bother to make much accompaniments with these. We we make this paratha occasionally we want the chokha, chutney and dahi etc. The recipe is simple. In a food processor or chopper it becomes easier but can be done manually too, chopping the onion garlic I mean. Else just chop everything fine so the flavours seep into the sattu powder well. Mix all these well and sprinkle some water to mix so that the stuffing mixture becomes the same consistency as that of the dough. You have to massage the chopped onion garlic etc with sattu to make the water from the chopped vegetables to mix with the sattu, sprinkle a little more water if required. This mixture is stuffed into whole wheat dough, rolled to make a flat round paratha and fried on hot tawa with some ghee. Ready to eat, suitable for a weekend breakfast with lassi or dahi or as a dinner with some...tomato salsa. Having some sattu filling on the side is being greedy for the sattu goodness. Here we enjoyed it with plan baingan ka chokha and plain Ramturai ka bharta. I fire roasted both baingan and ramturai, peeled them off and saved the pulp. Roasted baingan is mashed it only with salt and mustrad oil and the ramturai is blended in a mixie along with green chilly, little garlic, salt and mustard oil. Both these accompaniments are just too good with this paratha. Let me know whenever you make sattu ka paratha. Hugs to u dear. The paratha is very nice. S also read ur post and mentioned it's very popular in Bihar. Adding achaar is a great idea. i have the famous litti chikha of bihar in my archives too. didn't know you could make paranthas with sattu ka atta. Looks delicious. In MP, especially Indore, I've had sattu ke laddoo which are like besan laddoo but better. If I am not mistaken Punjabis also make a sweet powdery stuff for prasad with it.